Are you unknowingly enticing potential thieves to damage your property or break into your home? While you want your home to be a welcoming environment for family and friends, you might be surprised how common habits might be inviting to criminals, too. There were more than nine million property crimes in the United States in 2010, according to the FBI. This statistic includes vandalism, arson, larceny and theft. Fortunately, there are steps you can take to reduce your risk for burglary and property damage with these easy-to-follow tips, from our partners at Trusted Choice. While you probably lock your vehicle and the main points of entry into your home, you may overlook locking your fence gates, garage or garden shed from time to time. An unlocked gate allows a thief access to your backyard, away from the view of your neighbors. Once inside your yard, a thief has more freedom to peer through windows and patio doors. Access to garages and garden sheds also gives a thief more tools to use to break into your home. For example, a ladder in your back yard could make it much easier for a criminal to enter your home from the second story—where windows are more likely to be unlocked. Tools such as drills, hammers, and crowbars are also kept in many sheds and garages and can be used to break windows and open doors. Even if a thief is unable to get into your home, your back yard likely has valuable items such as a barbeque grill or bicycle. When choosing between buying a house or renting, you may benefit from considering the following questions from our partners at Trusted Choice®. Approaching the decision with as much information as possible can be helpful. This is one of the most important factors to take into consideration. Sure, you do not need a 20 percent down payment to acquire a mortgage; many mortgage companies will accept 10 percent and FHA loans can be had for as little as 3.5 percent down. However, there are a number of financial advantages to having the full 20 percent. Mortgage companies will require you to pay private mortgage insurance if you do not have at least 20 percent invested in the house. PMI is typically 0.5 percent of your total owed. You will need to pay PMI until you have paid your mortgage down enough that you have 20 pecent of the house’s value built up in equity. This is money you are throwing away. If you make your scheduled payments every month for 30 years, you will end up paying a total of almost $112,000 in interest. While that may seem like a lot, let’s look at an alternative situation. Suppose you buy that same house with the same mortgage terms but only put 10 percent down. Not only will your payments increase by $80 each month, but you will also end up paying more than $121,000 in interest plus about $4,400 in PMI. By waiting until you have the full 20 percent down payment, you can save yourself more than $13,000. In this case, renting while you save up enough money to put 20 percent down makes sound financial sense. Will You Be Moving in the Next 5 Years? Buying a home is a great way to build up equity; but if you need to sell that home within a few years of buying it, it is possible that you will lose that equity and then some. This is because if you sell your house through a realtor, you will need to pay the realtor’s fees, which typically run about 6 percent of the home’s value. Many financial advisers refer to the “Five Year Rule” of homeownership. This basically states that unless you plan to retain ownership of your house for at least five years, it may not be a sound financial investment. There are ways around this, of course. If you want to buy a house but expect to move within a few years, buy at the lower end of what you can afford and make extra payments. By doing this, you can reduce the total principal owed at a much faster rate, enabling you to profit through the sale of the house. How Much Your Monthly Mortgage Payments Will Actually Be? If you have been considering home ownership, you may have gone online and looked at some realtor’s listings or you may have used a mortgage calculator to get an idea of how much your monthly payments will be. When you look for houses on sale, you may see something like “Only $900/month.” What you are looking at, however, is almost always an estimated mortgage payment based on 20 percent down on a 30-year mortgage. If you are unable to put that much down on the house, you can expect the mortgage payment to be higher. Also not included in that quoted cost are other monthly expenses such as school and other property-based taxes, homeowners insurance costs and PMI if you are not putting a full 20 percent down. So that seemingly manageable $900/month could actually be more like $1,300/month. Be sure to consider the extra costs of home ownership before deciding whether making the switch from renter to home owner is a cost-effective decision. Can You Afford Home Repair and Maintenance Costs? Owning a home can be expensive. This is something that many first-time home buyers learn the hard way. If you are used to renting, you may be spoiled by the ease with which you can have problems fixed. If the air conditioner stops working or your oven conks out, you need only call your landlord or the apartment manager and they will usually have it repaired or replaced quickly. When you own your home, however, appliance breakdowns will necessitate that you pay for repair or replacement costs out of your own pocket. If you are living on a tight budget after purchasing your house, this can be cause of financial hardship. Do You Enjoy Doing Yard Work? Many people enjoy the freedom of having their own yard in which to plant a garden, do landscaping projects and enjoy dinner outdoors. For others, the need to mow grass, trim hedges and rake leaves is a never ending chore. If you enjoy working outdoors, you may benefit from purchasing a home with a yard that can keep you busy year-round. If yard maintenance is not your thing, you may be better off either renting or buying a condo or townhome where outdoor areas are maintained by the condo association. Can You Benefit From Deducting Your Mortgage Interest? Interest on home mortgages is deductible, but the deductibility doesn’t offset the fact that you are paying someone interest. It’s an expense. The ability to list mortgage interest on your itemized deductions may be beneficial to you. However, many people, particularly those with children, find that even when they add in their mortgage interest, their standard deduction exceeds the itemized deduction, so mortgage interest has no bearing whatsoever on their taxes. If you are buying a home simply for the mortgage interest deduction, you may not be doing yourself any favors. Make sure that you have other, more compelling reasons. Talk to your accountant first because the actual benefit from a deduction varies from family to family. This is one of the many advantages to home ownership. In most cases, those who rent their house or apartment are limited by the property owner on home improvements they are allowed to make. Some landlords won’t even let tenants put nail holes in the walls. If you do not like the pattern in the carpeting or the color of the paint in your rented home, you must live with it. As a home owner, however, the you can do what you like with the property. Regardless of whether your rent or own your home, our independent Trusted Choice agents can help you find an affordable home insurance policy that covers your personal property. Let’s talk today. An increasingly popular vacation idea is to rent a house or an apartment to stay in when you’re away from home instead of a hotel room. The advantages of rentals are that they can provide more space (which can be important when traveling with a family), they can offer amenities such as kitchens so that you don’t have to go out for every meal and some vacation rentals can deliver more value for the price than traditional hotels and resorts. However, if you’re planning on renting a beach house for the family reunion or a cabin in the mountains to get away for a weekend, there are a few things to consider, according to our friends at Trusted Choice. Your policy also provides for coverage for property that is “used” by an insured, so that if a television belonging to the landlord is damaged, you would have some coverage; there is $1,000 coverage in homeowner’s policies for an insured damaging someone else’s property. A standard insurance policy provides for coverage for property damage you may be found liable for, so that if you are grilling outside or cooking in the rented house and you accidentally start a fire that damages the property, you should have coverage. If you are renting a vacation property, check with our Trusted Choice independent insurance agents about the coverage you have in your homeowners or renters policy when making your plans. For example, my wife and I rented a chalet in the mountains for our anniversary. She took a shower in the loft bathroom and the tub curtain wasn’t pulled completely shut. Water leaked through the ceiling into the room below. IF we were liable for this damage, our policy would only cover $1,000. A personal umbrella policy might provide more coverage. Our agents can help you obtain an umbrella policy or review an existing one. Whether you are a college student, saving up for a down payment on a house, or you simply like the flexibility of apartment living, it is a good idea to become familiar with renters insurance and how it can protect you. 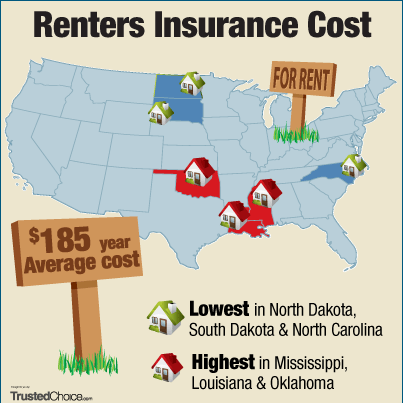 Renters insurance is known to be the least-utilized insurance coverage available despite the fact that it is also one of the most affordable, according to our partners at Trusted Choice. If you are on a tight budget, you may find it difficult to justify spending money on a policy that is not required. However, it is a good idea to investigate how much renters insurance costs to see how sensible and low cost this protection can be. There are several steps involved in deciding how much renters insurance you need. Decide how much coverage you need for your personal property. To determine this, assess your belongings including furniture, electronics, clothing, artwork, kitchenware and collectables. Note that if you experience a loss, your reimbursement costs cannot exceed the coverage amount you choose, so be sure to think this through. In the event that you were to lose everything, would your coverage be enough to allow you get back on your feet and start over? Choose the amount of liability coverage you want. Your liability insurance will provide coverage for medical bills if someone is injured on your property, as well as legal expenses if needed. Because the cost of a law suit and legal fees can exceed $1 million, many insurance professionals recommend purchasing more than the standard coverage. If your liability coverage limit is $100,000, you could end up paying the costs of damages and legal fees out of pocket. Even raising the limit to $300,000 can provide peace of mind. While raising your liability limit will increase your premium, it’s probably more affordable than you think. Most insurance companies impose caps on how much coverage they will provide for various categories of personal belongings. If you have an extensive amount of electronic equipment, designer clothing or any other sort of expensive collectable, you may want to consider purchasing additional endorsements, or riders, to obtain full coverage for these things. Get more information on Renter’s Insurance.